Will Trubridge's World Record attempt to reach a depth of 102m on a single breath. 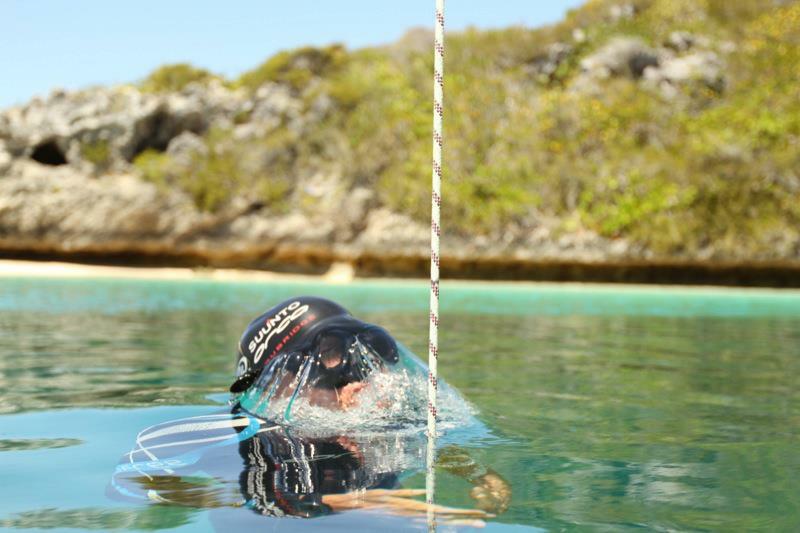 On the 16th December 2010, William Trubridge broke the CNF World Record at Dean’s Blue Hole in the Bahamas. He dove to a depth of 101m (331.36ft) on a single breath, using only his arms and legs to propel him. 2 days before, he had set a new record, 100m at the same site, and became the first man to reach a depth of 100m without the assistance of a rope or fins. 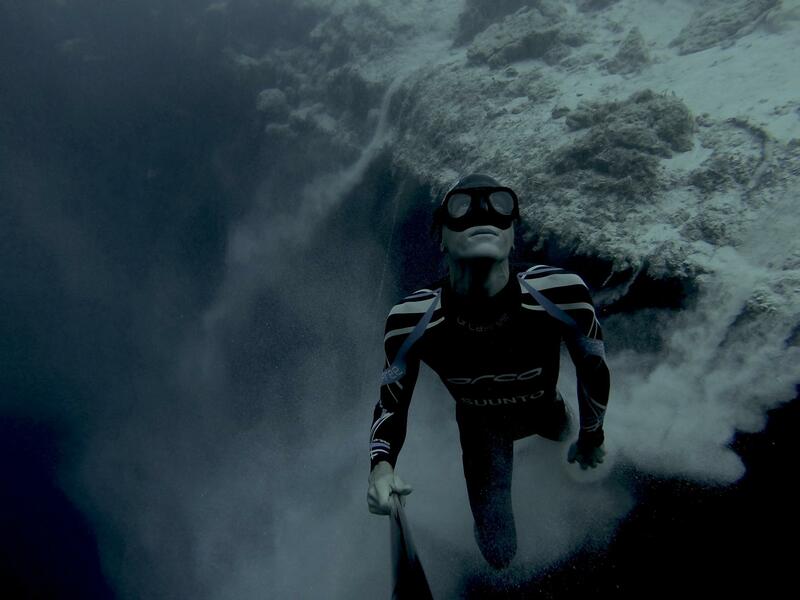 On 3 December 2014 NZDST (2 December in the Bahamas), as part of the Vertical Blue 2014 competition, Trubridge attempted to break that record with the world watching, and while he didn’t succeed, he brought freediving to the general public in the most amazing way possible. Moss Burmester, New Zealand Olympian and Commonwealth gold medalist in butterfly, retired from competitive swimming to enjoy his spearfishing and freediving. He is at Dean’s Blue Hole as part of the Safety team, and is giving us insights into the goings on at Vertical Blue 2014 as part of his trip around the world. Full posts on his observations at VB2014 can be found at his website, MossBurmester.co.nz and his adventures around the world are at Four Jandals. Remembering Nick and Day 6. With me starting to fully realize what this place and comp means to the world of freediving it was re-enforced while on the first flight to Nassau in the Bahamas. The in-flight magazine contained an article by Brittany Trubridge, William Trubridge’s wife. From the carpark the hole is to the left, the weather for the last week has been messy and pushing into the hole, though reasonably sheltered from the ocean directly the water wasn’t crystal clear, with plenty of weed and unfortunately rubbish floating in it. Though despite this it was still amazing, the evening sun was setting so the cliffs on the far side were glowing, and the beautiful white sand led the eye to the water’s edge. I immediately was drawn towards the hole, half way across the beach I realized I still had my shoes and socks on, I bent down removing them quickly without even undoing the laces. I walked straight to the water’s edge, peered down then stepped forward into the water. Though not the most spiritual type I had an immediate urge that I wanted to connect to the place and the only way to do it properly was the feeling that I needed to be in the water. People were done for the day (or so I thought), so it was empty, quiet, peaceful, and had a real energy about it. Final day of setting up; stringing up the country flags, putting in the official line (measured out to 140m! ), picked up O2 cylinders for the athletes that will be using it for post deep dive DCS. Learning a huge amount, both about setting up/running a freediving event and breaking ground on best practice rescue and emergency medical procedures. Tom the head medic here is great and we have been playing with all the “toys”, if you watch the first VB video on youtube, you will see Jono and me in them. Been some very solid dives in the last couple of days with the athletes, 103m CWT yesterday and an athlete did a 120m FIM today. Marco was deep safety and said everybody looked good, though talking with Will after he did mentioned he got some pretty big contractions on the way up. Registration was also yesterday, great to put some athlete names to faces though I’m pretty new so don’t know to many of them. Comp day tomorrow, you would of seen the announced depths. First OT at 9am but we will be there from 7.30am. Our safety team of six works on a rotation, 3 safety divers on the comp line, one on the warm up lines, one on the platform, and one on the beach/resting. Guess you have seen results, good to get the first day underway and calm the nerves a little. Yaron’s BO was from 12-ish meters, rescue breaths done and he came to as he was pulled onto the platform. I was mid safety (20m), Jono deep safety (30m) on Alexey, BO about 5m from surface, 2 rescue breaths done from Jono, then he came to in water. Evgeny had a block and turned at about 20m. Tomorrow’s dives all look pretty sensible, Will’s nominated 93m, would say he’s being safe and wanting to get some decent points on the board for the overall, then he will obviously push it when he goes after the 102m WR. Safety team and number of the divers went to Rowdy Boys for Thanksgiving dinner, good food, music and of course conversations about Freediving. A number of the athletes have heard I’m an Olympian or seen my rings tattoo so getting asked lots about that. Rebecca (my partner) is also helping out Brittany with athlete check in and taking athletes post 30min dive oxygen saturation level and heart rate for safety purposes. New regulations that VB has put in place and as you probably know AIDA are implementing next year. Chris Chang from TVNZ turned up today, was at Rowdy’s so I had a good chat with them and will be doing interviews at times. I’m also trying to help keep them from asking for Will all the time. That’s about all for now, off to sleep and back early at blue hole, 7.30am in the morning. Today was tough on the athletes, weather is not playing ball. Water 26 degrees (cold for here), overcast, very windy, athletes were all getting cold before their dives. Kate still had a good dive, Will not so much. You may have seen his post about it on facebook. I think he (and Brittany) are likely really feeling the pressure of the media and expectations, I know what it is like from my swimming days and it can be a huge distraction and add a lot of pressure. The coverage of Will is amazing for him and the sport, but to be honest detrimental for him at the same time, as it really adds pressure. Few black outs today, Will and Lena on the surface, both so close to pulling through. Other was Mike, I was safety and grabbed him, adrenaline was pumping! Gave a surface rescue breath and he came round. Safety team reckons I’m faster than the counter ballast! Chris Crawshaw, a Freedive Gili trainer with Mike and Kate, has written more about today’s blackouts and other such events from a competitor’s point of view here. Big day tomorrow, will have to be ready for some monster dives, makes our job as safety diver tough! Big day tomorrow, obviously Will’s dive but also also some deep dives for other athletes. Wanted to reinforce what Kate said about the Freedive community here, it really is a great group of like minded people who are super supportive of everyone. Both Rebecca and I have very included and are making some great new friends. Today was a weird kind of day, some great dives, e.g. Kate, Lena, but weather was terrible and there have been some decent squeezes. Had a big meeting ahead of Will’s dive tomorrow. Just between safety/organizing team and the film/production crew, PR people and Steinlager reps. They are also going to be making a 23min doco from this all for US TV. Will has asked Jono and me to be his deep safeties which is an honour. Weather is not looking good for tomorrow, conditions are not ideal. We will have to be on our A game! When the next VB video comes out it features us (the safety team), it is quite amusing, though a little embarrassing for me. Stoked to make the news the other day, though said some stupid stuff (“air tube” “still wasn’t breathing”) in it, I was thinking to much about how to phrase it for the general public who don’t understand freediving and dropped those gems! Will send an update tomorrow after Will’s dive, Here’s hoping he uses everyone’s support from NZ, etc to channel it into an awesome successful dive! More from Moss. This is the opening paragraph of Moss’s fantastic blog post on safetying Will today. You can find the full post and links here. Firstly what an amazing athlete and person Will Trubridge is, an incredible guy pushing the absolute boundaries of freediving. As a 15x World record holder he is totally dedicated to the sport and this 102m World Record attempt has brought the sport so much attention. Yet he is a super humble guy and I’m honored to have been able to be one of the safety divers for his awesome attempt. Continue here. Well, yesterday was a break day from VB comp, though almost everyone still gather down at Deans BH for the Apnea games day to honour Nic Mevoli. Though we didn’t know him he sounds like an amazing guy who touched a lot of people’s lives. The games day was a lot of fun and details of it can be read on the very amusing Freedive-Earth posts. After the games day, the safety team and a few others headed to the beautiful Galloway beach to play around and watch the sun go down. Though, as soon as it does, the mosquitoes and sand-flies emerge in swarms to devour anyone foolish enough (which was us all) not to be covered up by clothes or repellent. So we soon bailed back to the accommodation. The comp days are always divided into three sessions with medium first, then deep, then shallow. So today started with the “medium” depth divers, remembering that we are at Vertical Blue the “medium” first dive was an 88m attempt from Tomoka Fukuda! The depths these athletes are doing is amazing and something I’m still blown away by. Mr Trubridge started the deep session with a monster 120m FIM, I was a deep safety again and he looked pretty narced but comfortable on the ascent, though I didn’t get a chance to chat with him after his dive to ask if this was the case. As I was swimming down to meet Will for the ascent I noticed that I was going deeper than the counter ballast that runs off the back of the platform. The rope is measured to 140m and then some for the counter ballast, so when I dropped past it, it really hit home how amazingly deep some of these top guys dives are! Though the deepest dives are very impressive watching some of the “shallower” divers achieve their dives is just as rewarding and easily as emotional. Many of them have been trying for the same depth and just missing for various reasons over the last week, so when they achieve it it is very emotional. Most of the epic daily videos being produced by the Vertical Blue team show these stories briefly, as you will see from today’s day 6 video. It features Aurore Asso achieving a 82m CWT French National record, where upon completing her surface protocol bursts into tears of joy. Again Rebecca and I have been humbled by the friendliness and inclusion of the community here at VB. An amazing group of athletes, coaches, organizers, and supporters who all share a love of the water and freediving.